Industrial steel arch buildings and metal garage kits. suit most industrial business purposes from agriculture to manufacturing and retail. Government agencies, industrial complexes, and commercial or manufacturing companies are some of our best clients. 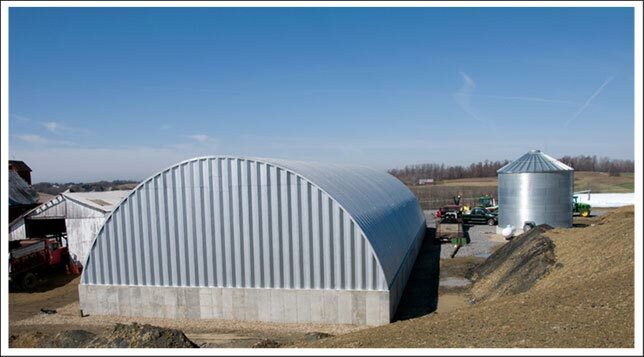 Steel arch buildings provide the integrity and security you need for your manufacturing plant, commercial operation or agriculture business. Metal Building Kings® pre-engineered metal building system gives you a lower cost for construction and materials while providing the strongest and most secure metal building available for purchase worldwide. The steel used in our panels comes in heavy roll formed 14 gauge to 22 gauge 80,000ksi tensile yield carbon metal with with aluminum-zinc alloy and silicon. The entire system has a 7.5" corrugation for strength to withstand 170 mph winds. 100% clear span building arches means no beams or posts or trusses and the steel arch building has 100% usable area inside and is secure and impenetrable to all outside pests or intruders. The metal arch system is fully expandable to different lengths and can be insulated or climate controlled depending on environmental conditions. Install structures to hang lights, climate control, intercom systems, and work stations for your industrial equipment. You can customize the end walls with powered roll up gateways or add walk through entrances. We can also assist you in designing windows or adding custom insulation and ventilation systems to accommodate your industrial needs. The Metal Building King arch building uses a specialized paint coated with a silicone-protected polyester coil coating system, a state of the art coating to help prevent rust and comes with an industry best 40 year rust-through perforation warranty and a 40 year warranty against peeling paint, flaking an loss of adhesion. Our steel arch kits also include easy to follow step-by-step guide to installation, ensuring that you’ll work smoothly throughout the process and our customer service representatives are just a phone call away ready to assist you. For larger industrial projects we offer our turnkey solutions that provide assistance with permits, building plans, monolithic foundations, construction and strategic interior designs and equipment. If you require complete turnkey assistance on the construction of your project, our experienced contractor services department will assist you in getting the job done right or send field construction consultants to assist your local contractor. Your metal garage kit will be delivered directly to your site and our engineers have the knowledge and experience to make sure your building is in compliance with your local county building codes.